I have struggled with my skin for as long as I can remember, I have gone through severe acne as a teen and into my early twenties, I have tried many skincare products aimed at fixing acne....they didn't work and after many long nights of researching products and countless weeks of trailing I finally have a skincare routine that is working for me. First off, lets talk cleansers this is where I was going wrong with my skincare, I bought every cleanser that was full of salicylic acid thinking it would cure my acne but all it ever did was just leave my skin feeling dry and looking red. 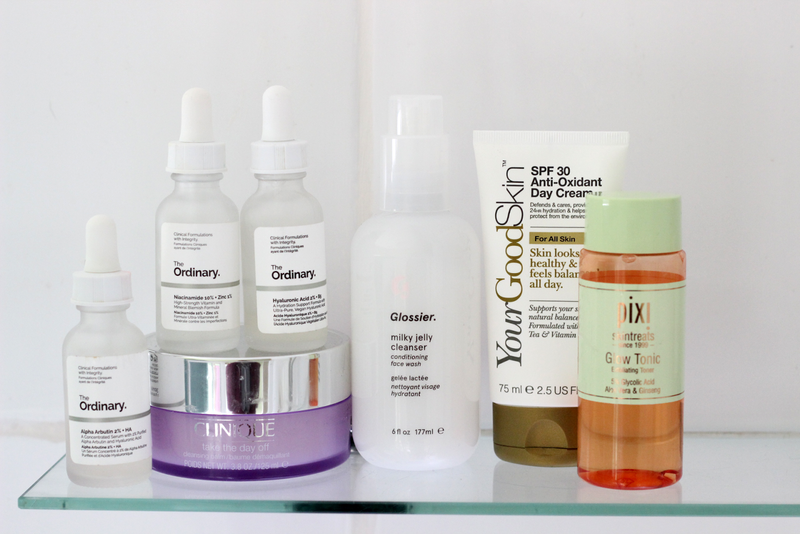 I decided about a year ago to take a more gentle approach to skincare, to use products that seem to not promise to do much and it really has changed my skin. First off on days I wear makeup I opt to remove it with Clinique Take The Day Off Balm, this stuff is life changing and I am mad at how long it took me to buy it. I apply this to dry skin, massage all around the face and then mix with a little bit of water to turn it milky and then remove with a muslim cloth and voila every single trace of makeup is gone. For my second cleanse or just in the shower cleanse (morning wash) I tend to use a no frills cleanser, something that just cleans the skin. Now I have thrown a new cleanser into the mix here as I am currently trailing it but before this I was using First Aid Cleanser and I love it, it's gentle, cleans the skin and gets the job done. 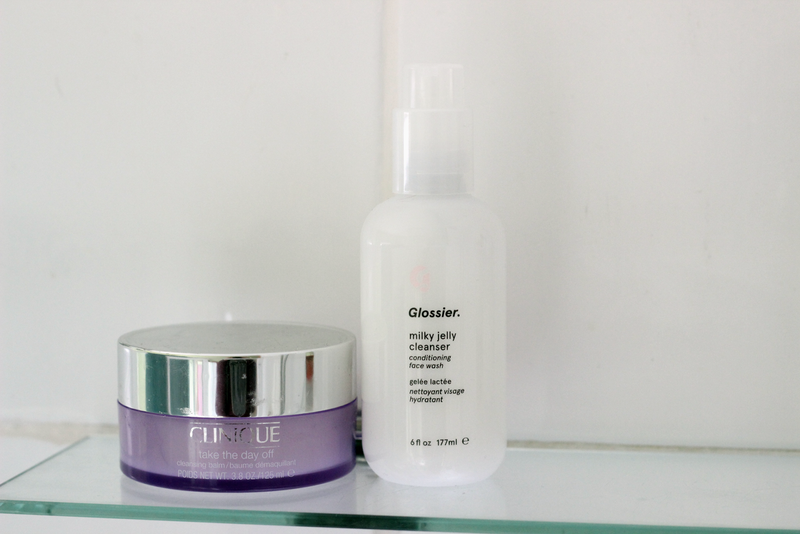 However I am trailing the Glossier Milky Jelly Cleanser and so far I am enjoying it, again it just cleans the skin without drying it out and leaves my skin ready for the day. I also use this as second cleanse in the evening. Now here come the treatments, I am a huge fan of serums and potions that target certain problems of the face. I like to use Pixi Glow Tonic about twice a week depending if my skin allows that ,sometimes I will only use it once a week however this is a chemical exfoliator that removes dead skin, renews the look of my skin and feels so refreshing. I prefer to use chemical exfloliators than the scrub ones as my skin is sensitive and this one does have glycolic acid in it which is great for scarring, pigmentation issues and so much more. 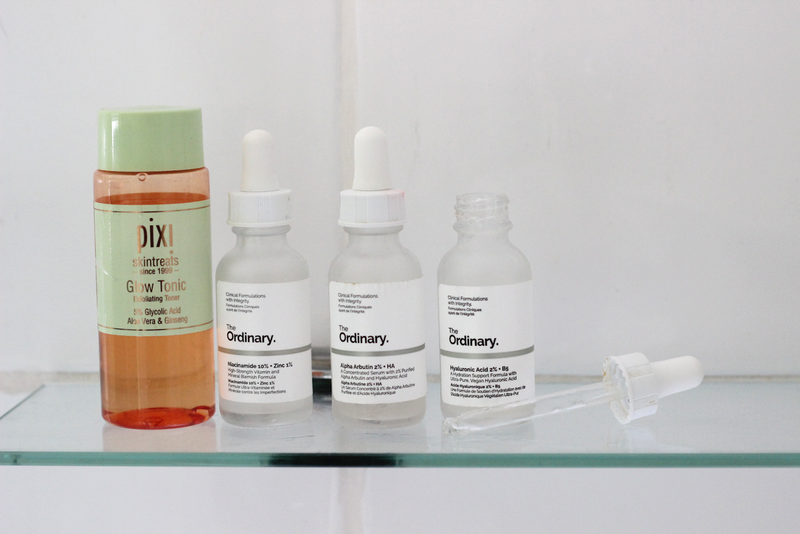 I also love The Ordinary Skincare it is affordable and the stuff does wonders for my skin. I use the Hyaluronic Acid pretty much everyday, this gives my skin a plump looking effect and provides good hydration and it works great under makeup. As well as the Hyaluronic Acid I love to reach for the Niacinamide 10% Zinc 1% serum, this stuff is a god send for blemishes and decongested skin. I apply this everyday in the morning to keep my skin at bay. In the Nightime I keep the routine very simple, remove makeup and then apply Alpha Arbutin serum this is great for acne scaring, pigmentation and texture. I have noticed a huge difference in my skin since using this. I also sometimes use the Lactic Acid 5% from the Ordinary but it really does depend on the mood of my skin as It can be a little harsh however its a great little exfoliator if I use this I use it in the evening as it's not great to be exposed to sun straight after applying. Speaking of Sun, my one holygrail product and I am sure a lot of you already use and that is Sunscreen. Ok confession time I used to let my foundation be my SPF until I understood the difference my skin had gone through from just wearing a sunscreen daily. 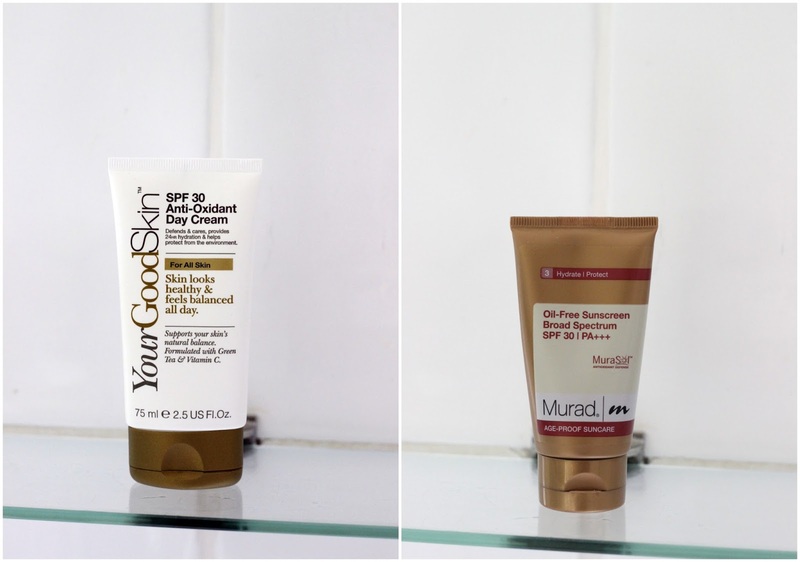 I tend to switch between two sunscreens and it really depends on my mood on the day, the first one is actually a great little bargain and that is Your Good Skin SPF 30 Anti Oxident Day Cream. Your Good Skin is a new range from Boots that is so affordable and I gotta say I really love this cream its lightweight, works under makeup and leaves no white cast all that and it has spf 30, it also provides good hydration through out the day without leaving my skin greasy. I highly recommend. My other sunscreen is from Murad and has been in my makeup bag for a long time. I always seem to keep repurchasing this one, yes its pricey but it works well and it smells incredible. So there it is my streamlined skincare routine, it is so good to be able to have something that is working, my skin is looking so much better, yes I do get the odd spot and my scarring isn't 100% disappeared but this has helped so much and with all the hormone issues (PCOS) I have going on I am just happy something is finally working. Let me know what products you use in the comments and any recommendations that you think I will love let me know.